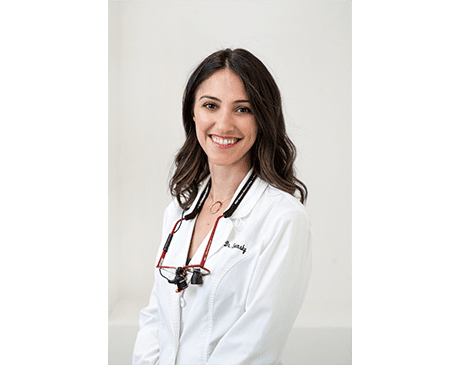 Dr. Irina Sinensky is a Cosmetic and General Dentist located in Greenwich Village in New York, where she co-­owns Dental House with her longtime friend and colleague Dr. Sonya Krasilnikov. Passionate about educating her patients and staying up-to-date on everything related to the world of dentistry, Dr. Sinensky is constantly learning and growing in her profession. Dr. Sinensky is well-educated in general dentistry but specializes in cosmetic dentistry, dedicated to providing her patients with healthy, natural-looking smiles. She is a graduate of Stony Brook School of Dental Medicine, where she earned her Doctor of Dental Surgery degree. Dr. Sinensky also completed her general practice residency at the prestigious VA New York Healthcare System - Brooklyn Campus. Always learning, Dr. Sinensky later completed an Implant Dentistry Residency at the NYU College of Dentistry. Today, she has memberships in the American Dental Association and the New York Dental Society. When she is not shaping the perfect smile for her patients, Dr. Sinensky loves to spend time with her husband, Michael, and their three children, Arielle, Joseph, and Hanna.